It’s an annual holiday Celebration in the Queen of the South, grand parade of Sinulog Festival. Every third Sunday of January the participants are street dancing with replica of Santo Niño. As to some people the Santo Niño was first parade 1865 when the expedition of Miguel Lopez de Legazpi arrived in the island. You can feel the spirit of the festival on every face of the people who experience the grand festival. Its shows the faith and dedication of the people who celebrates Sinulog, this is also considered as grandest festival in the country. Other places are celebrating Sinulog Festival even some other countries by the Filipino Community. The Festival also promotes the city as one of the best tourist Spot in the Philippines. Also their products like; dried mango, dried fish and other food they’re best at. You may feel deep devotion from the people as they say ” Viva Pit Senyor ” – Long live, call on the Holy Child Jesus. Aside from the Grand Santo Niño Parade and Street dancing, they also have this fluvial procession, devotees waited by the shores of Mactan Channel as the Sto. Niño was paraded around the port area. Starts on Friday before the Grand Sinulog Festiva when the image of the Sto. Niño was brought to Lapu-Lapu City through a motorcade — passing by Mandaue’s Shrine of Saint Joseph. From there, the image of the Holy Child Jesus was brought back to Cebu City in a fluvial procession. In the town of Daanbantayan in northern part of Cebu beautiful white beach Malapascua Island can be found. They also have a world class diving spots. From Cebu Northern Bus Terminal the easiest way, 4 hours travel going to Maya Port then 30 mins boat ride. You may also find cheapest accommodations in the Island that ranges from P300 – P500 if you prefer a fancy room. Resorts are mostly beachfront where you can enjoy fantastic views or spend sunrise and sunsets aside from enjoying the white sand beach. The Island lies for just about 15 – 20 minutes off the coast of Oslob Cebu city, it has a white powdery sand, turquoise water and beautiful sand bar stretches to hundred meters. On the other side you will also enjoy the view of the mainland Cebu and the endless horizon of the blue waters of the ocean. Its roughly 3 hours travel from Cebu South Bus terminal. Not only the beautiful beach and white sand but Whale Shark Feeding and watching is the main attraction in this tourist destination spot. The huge gentle giants locally called “tuki” is the reason why many tourist from other provinces and even from other countries are coming to Oslob Cebu, you can swim with them and feed them as well while doing snorkeling. Scuba divers are also round the area. This is only a two hours drive from the city, best scuba diving spots or diving paradise not only Cebu but in the entire Philippines. dive sites in the area; Pescador Island, home to hammerhead sharks and the famous sardine run. You may also find some dive shops where you can buy diving gears and other things that you need to fully enjoy and take advantage your chance of doing scuba diving, shops are located in Panagsama Beach where tourist usually stay in Moalboal. Cebu City is rich in historical attractions and considered as the oldest city in the Philippines. 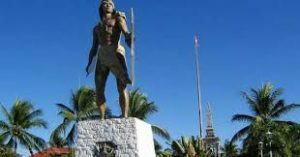 The place is named after Lapulapu -the great chief and ruler of Mactan. He was considered as National Hero who killed navigator and explorer Ferdinand Magellan. Magellan was the first Portuguese (European) to come to the Philippines in the year 1521. Along with his crew they brought Christianity and offer baptismal to signify the propagation of the Roman Catholic Faith. Magellan planted a cross which is now one of the historic tourist spot in the City. Some say that the original cross was destroy. The one display is only a replica as many people tried to steal the original cross because of its miraculous healing power. Lapu-Lapu and Magellan statues are stand in the place to recall the awful meeting of West and East in this part of the world. Known as one of the oldest fort in the country. It was built in the year 1565 by the Spanish and Cebuano laborers as Military Defense Structure, 14 cannons were mounted in the area. It is a triangle shape with two sides facing the sea with artillery, one side is facing the land with a strong palisade made of wood, they also built a tower used as viewing decks on each of the three sides and its served as bastions – the La Concepción at the southwest, Ignacio de Loyola at the southeast, and San Miguel at the North, towers are 30 feet high from the ground. It was Establish in Sibonga Town, Southern Cebu where the Monastery of the Holy Eucharist where Marian monks live, work and pray. The Shrine is one of those religious place in Visayas and most believers come to offer prayers, petitions, devotion to the Virgin Mother, and their wishes to obtain graces also to ask miracle to the people with illness whether its a minor physical sickness etc. Cebu City also known as Queen of the South is one of the big city island in Central Visayas. It is because of its large potential in terms of economy and infrastructure. 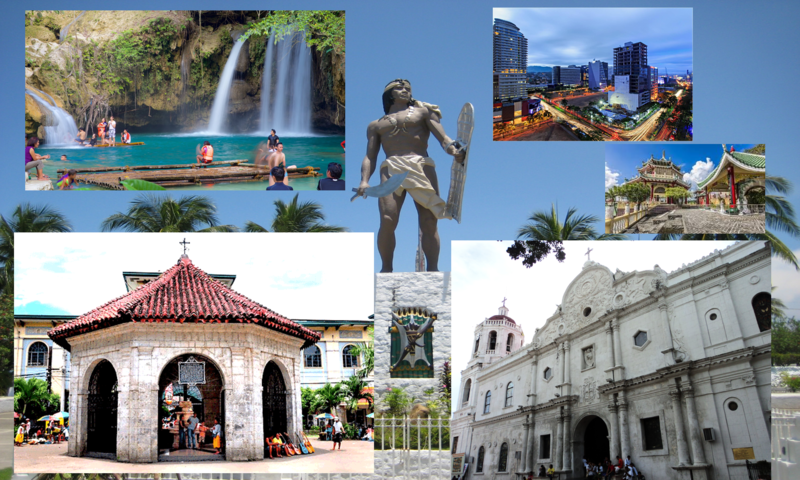 It consist of three big cities which is Lapu-Lapu, Mactan and Cebu City. However, Cebu isn’t just all about tall buildings and great opportunities. Cebu has its own dialect and traditions. Sinulog Festival, Fluvial Parade, Larsians – where you can eat different kinds of grilled seafoods and meats, Pungko-pungko – food stalls that you find along the streets selling a random assortment of fried food, Dried Fish and dried Mango. Authentic roasted suckling pig well known as Lechon Cebu which made them one of the best City in the Philippines. A lot of tourist destination and interesting places to visit. Some outdoors activities and beautiful beaches to enjoy during summer. Habal-habal (motorbike taxis) – it’s the local transport mainly useful for the people who lives uptown going to downtown city and vice versa. Jeepney – People of Cebu are mainly using Jeepney vehicle and it is very useful whether your need to travel to a short hops or even too far. Taxi/Grab/Uber – It’s an easy option to use in getting around the city. Taxi has their flag down rate of P40.00 and some amount for additional m/km of travel or waiting time in case there’s traffic or some stops. Bus – Buses are also available for city journey or travel from the city to another, provincial bus can also access through North Bus Station in Cebu, operation run from 6am – 10pm only. There are several infrasture are to be built and on-going projects in Cebu City. One is the Metro Cebu Expressway – The R50-billion Expressway, a 74 km highland road and they are planning to mix with a subway that will snake through the south Naga City to north part of Danao City. This project is expected to be done year 2022.